I love my blue dress, and I have redone it so many times now, but one thing was bugging me. It is to bright for what I want to do. 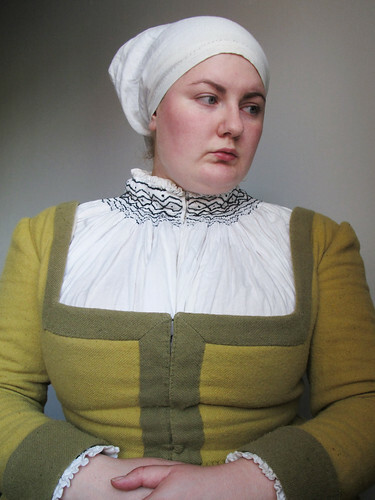 I am aiming to do a lower class woman, a woman that could have been a follower of the German landsknecht tross. And for that my blue dress was to fancy. I wanted to do something simpler, a lighter colour and a more “believable” dress. 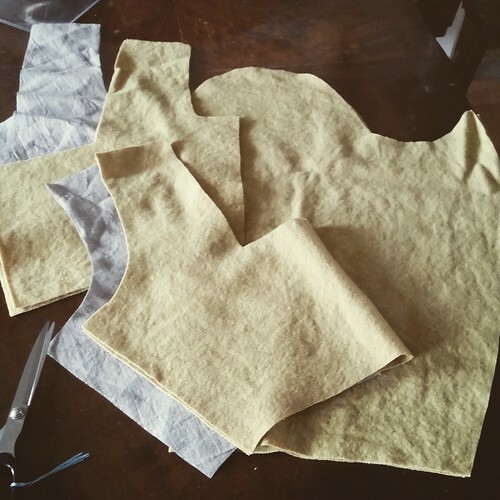 Then the idea of dying the fabric myself using a plant that would be easy to find and use. 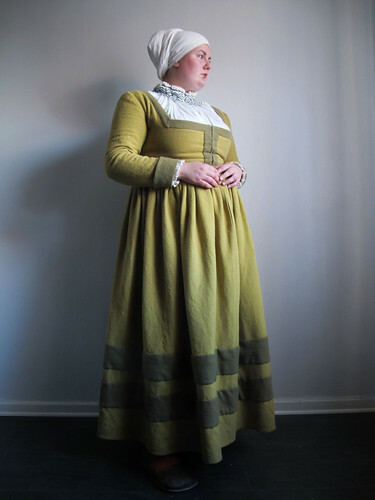 There are plenty of birch trees around so I knew that I would be able to gather all the plants I needed to dye the around 4 meters of fabric I needed for this dress. I started of by getting a really big pot. 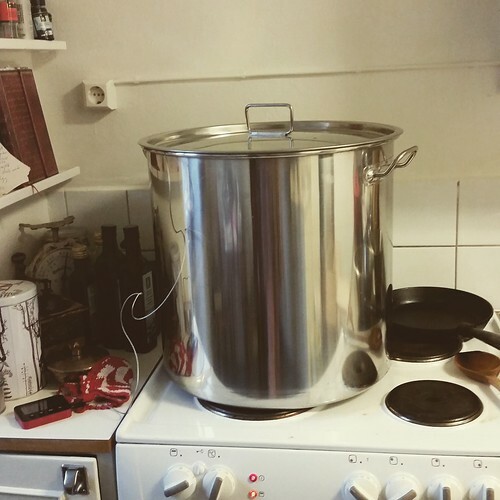 I got my 70 litre brewing pot including a lid at www.storagrytor.se and then I ordered some mordants and iron sulphate from www.dengamlaskolan.se I choose to use the twill raw weave from www.medeltidsmode.se for this project. As I love the surface it gets after washing and I had heard that it would be nice to dye. The raw weave is bought as the name implies “raw”. It is straight out of the loom, filled with spinning oil and the weave is quite loose. 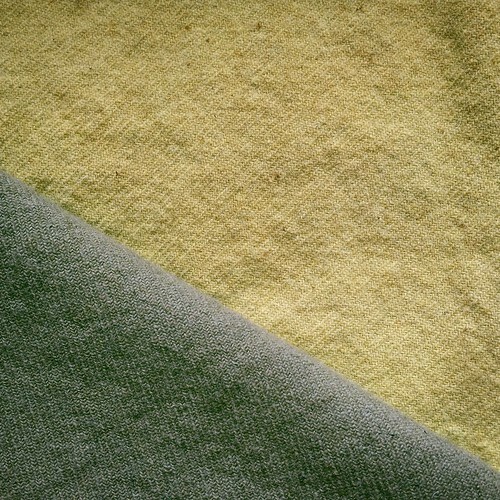 It is a fabric that is meant to be washed and fulled and should not be used as it is. It is inexpensive and kind of ugly with a dirty beige colour. 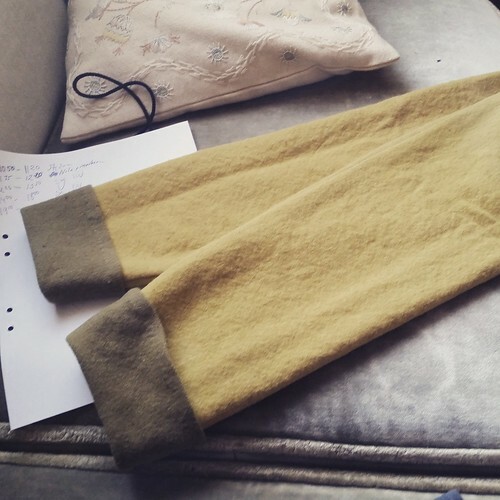 But when washed in 60°C it fulls nicely and you get a soft cream coloured fabric with a visible twill structure and it becomes a sightly fluffy but not to thick fabric. You can wash it in 90°C as well to get a heavier, more fulled fabric, but I just washed it in 60°C before I dyed it. One should also note that it does shrink a bit when you dye it as well. After getting a big pot it was time to add mordant to the fabric to make it possible to dye it. I added 10% of Alun and 5% Cream of tartar of the fabrics dry weight to a bit of luke warm water in the pot. Stirred it well to make sure it was all solved and then filled the pot up with water. 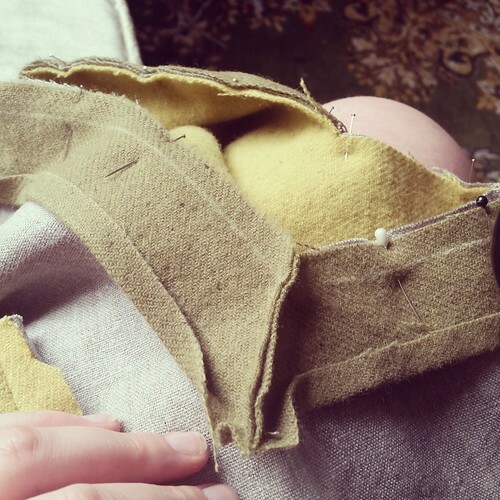 Then the fabric was added and the heat was turned on. You need it to heat up slowly to not chock the wool but that really is not a problem with such a big pot. It took me around one hour to get it up to the 80-90°C that you need and I kept stirring the fabric around all the time. 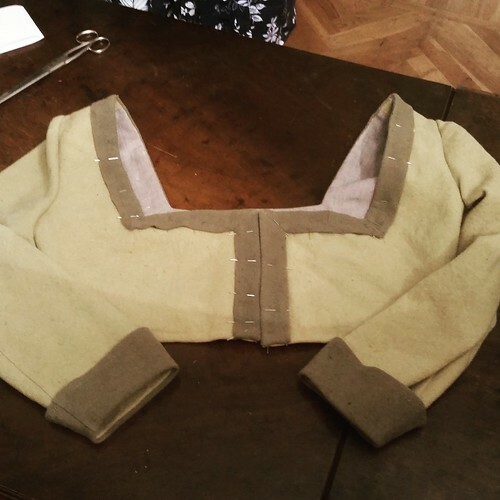 Then the temperature was held at 80-90°C for one hour and then the heat was turned down and I let the fabric cool down in the mordant water until the next day. You can either dye directly on the wet fabric, or you can let it dry (no need to rinse it out) to have for dyeing later. I choose the first one. It takes a lot of time to get all the leaves. You need to collect t least the double amount of leafs of the fabrics dry weight. 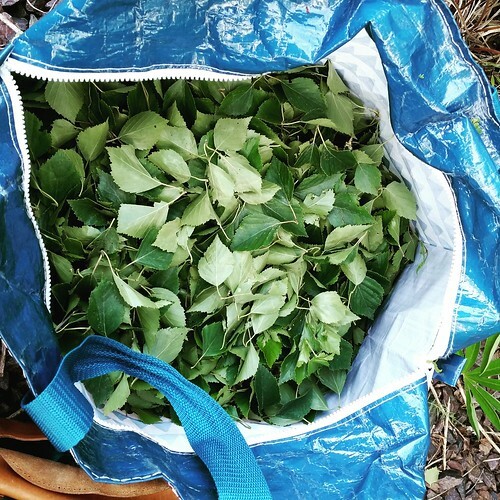 As I had around 1,5kg fabric I choose to pick around 4kg of leafs. Getting more then you need will perhaps not give you more colour but it can help with the light fastness of the colour. Better safe then sorry, also for birch it is good to know that if you pick the leafs after midsummer you can get a green tint to your dye, in stead of a clear yellow. This is what happened to me but I like it. You will want to get only the leafs and not any branches. 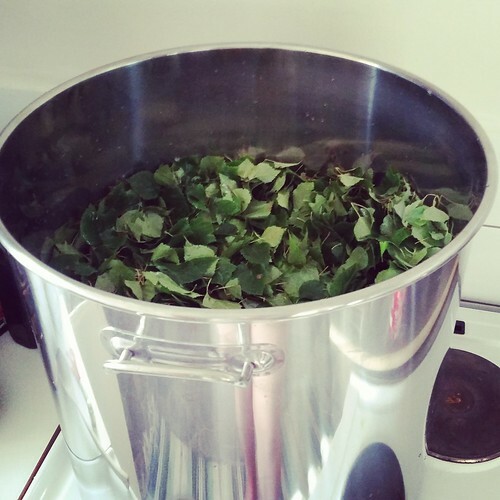 When all the leafs was picked it was time to add it to the dyeing pot that was now emptied of water and rinsed out. I added the leafs and then poured on water until the leafs was covered. Then the leaf soup was brought to a boil and then boiled for one hour. Birch leafs does not smell bad, but they smell special. After one hour it was time to take out the leafs. All the leafs need to be taken out as they can make stains on the fabric. Emptying a pot of 50 litres of warm water with leafs is a hassle. Really no that easy, but it can be done. When it was empty of leafs I added more water. I had so much fabric that I needed as much water I could get and also it is a good way to get the temperature of the birch leaf soup down. You do not want to add the fabric if the water is over 50°C as this is bad for the wool fibre. 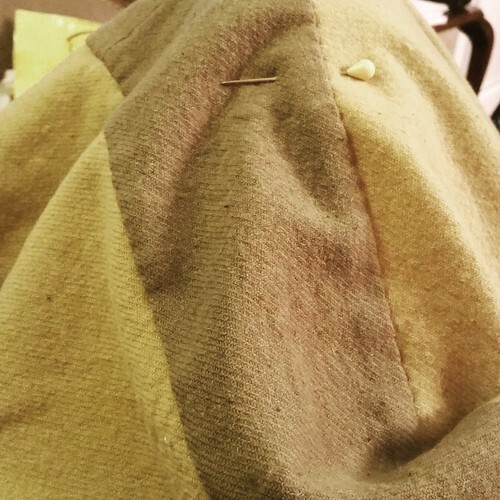 Then it was time to add the fabric. To make the fabric is even it is good if it is wet when you add it, mine came directly from the mordant bath so there was no need to wet it more. When the fabric is added you need to slowly raise the temperature to 80-90°C and you need to stir the fabric often to make sure that the colour gets even. When the temperature is at 80-90°C you need to keep it there for one hour stirring now and then during this time. When one hour is over I simply turned of the heat and let the fabric cool down to the next day. When cooled down I took it out of the bath and rinsed it well in cold water until the water was clear. Next day I needed to dye my accent colour. 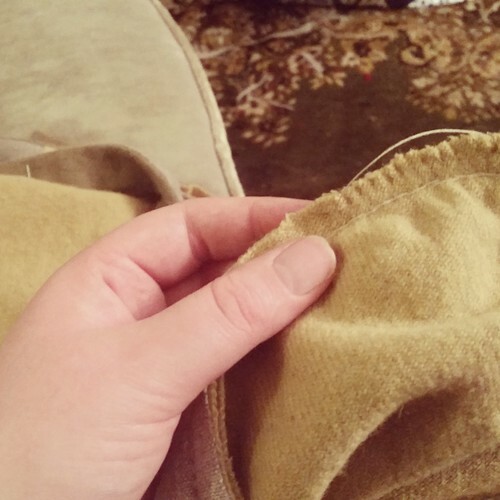 As I had so much fabric the first round there was no space for that piece. There is kind of a lot of colour last in the bath after the first round, so adding a fabric to the after bath and redo the heating and one hour at 80-90°C would give a nice but lighter yellow. As I wanted to have the same strength but green I added the leafs to the water again and boiled them again, to get some extra colour into the bath. After the same procedure as the last time; straining of the leafs, adding more water to cool it down, I added the last piece of fabric to the bath and let it slowly go up to 80-90°C. When the temperature was right I let my fabric sit for 45 minutes in the bath, stirring well. Then the fabric was taken out temporarily and iron sulphate was added; 5g for each 100g of fabric. I stirred it well to make it dissolve into the water and then added the fabric again. 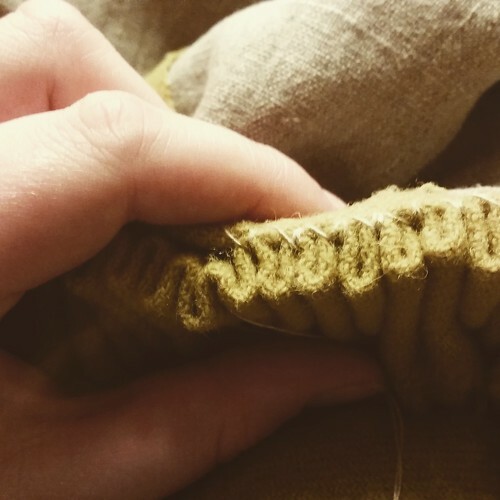 This turns the yellow fabric green. But it is kind of bad for the fibre so I only let it be in the bath for 15 minutes. Then It was taken out and I let it cool down a bit before washing it well in first warm water that gradually was made cooler to not shock the wool. Then it was finished and I only had to wait for it to dry, and clean up the mess in the kitchen. Taking a good photo of the colours was hard, but it kind of what they look like but they do change in visual appearance if you are inside our outside, in the sun or the shade. Then it was time for the cutting and sewing part. 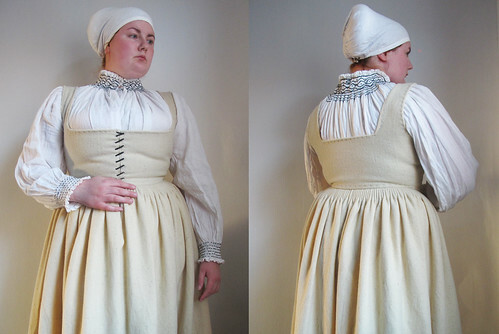 Of course I had very little time to sew this as I wanted to make it for medieval week on Gotland. I only had a few days but I was pretty sure I could make it at least wearable for medieval week. The assembly for this is the same as for my blue dress tutorial. 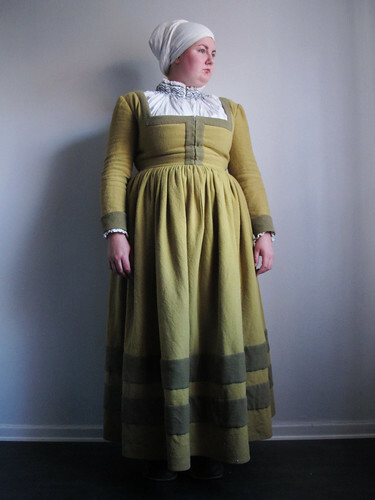 The difference is that for this dress I choose to not use the filler thread as there are no evidence that this was used in the 16th century and also I choose to try hooks and eyes and to not bone the front of the dress. Otherwise it was very straight forward sewing, I timed the dress as it is always interesting to see how much time it takes and for this dress it took me 25 hours and 5 minutes. 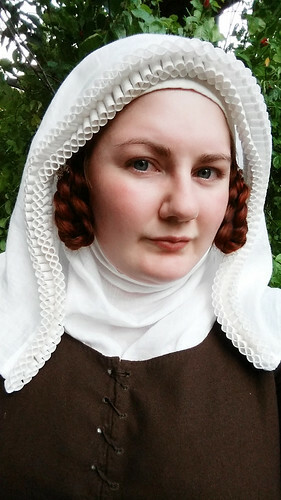 Not bad for a totally hand sewn dress, and yes it was finished enough to wear for medieval week. 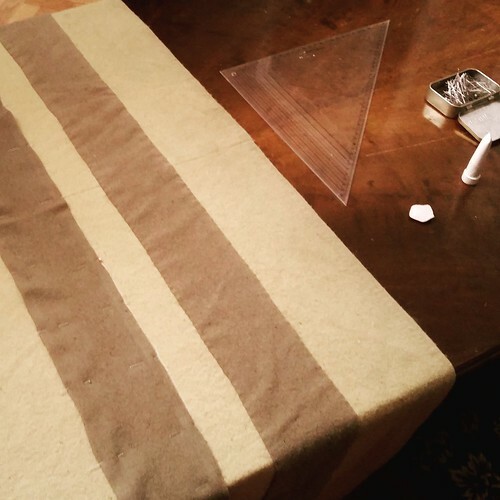 What was left to do was to attach one more stripe on the skirt as I wanted two and the cast down some of the edges inside the dress but that is included in the 25 hours and five minutes. 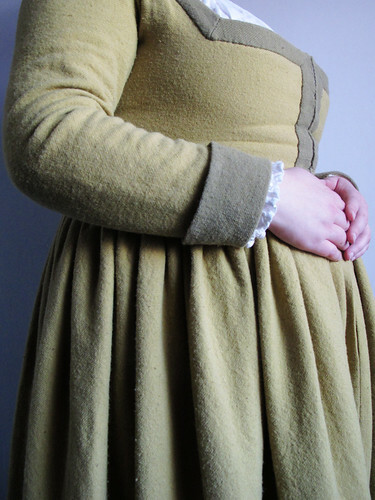 Under this dress I wear my wool under dress. 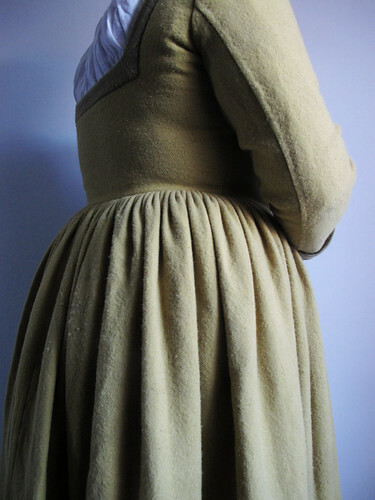 A sleeveless wool dress lined with two layers of heavy linen that is laced in front. The under dress is not boned and I find that wearing the under dress and over dress is plenty of bust support for me. And also it gives you a proper silhouette. 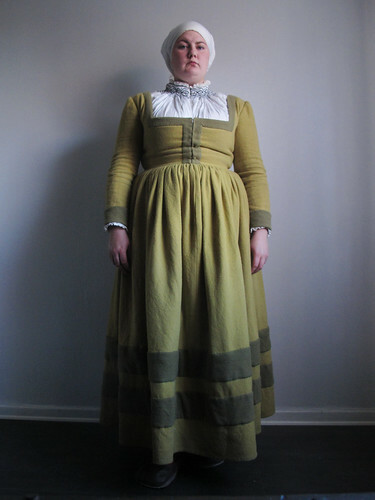 To make this outfit better I will be making a new smocked shirt and veil, pure white and embroidered it not all that fitting for a poorer woman so I will be making them in non bleached linen in stead. 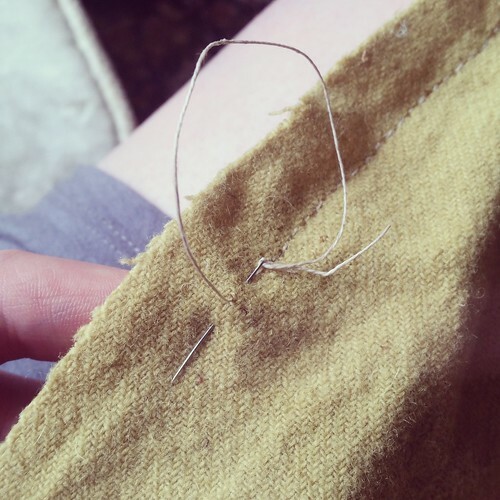 And smock using a tone on tone thread in stead. I hope you like it as much as I do. I like the fact that it is so simple and not slashed at all. It feels very real and possible. That turned out just beautiful. And a hopeful message for those who wish for a hand sewn and authentic kit without construction taking years and years. Did you weave the fabric yourself? Amazing dress! You look like a painting. You look like a 16th tradesman’s wife, that is to say perfectly period. Always informative and as always wonderful! Danke! Very interesting process. The colors are pretty. 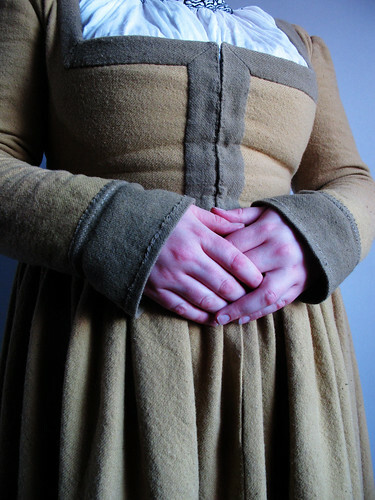 I like seeing the underdress, it looks so warm and comfortable. I want to have these! 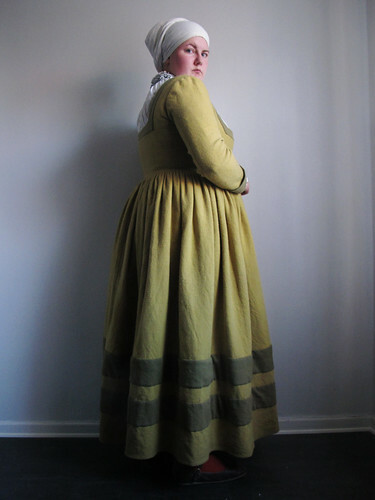 I love the colors from natural dyes and the birch leaves worked beautifully and the colors look perfectly period correct. Thank you for a great tutorial. Now I’m inspired to give it a try! My friend & I were watching a parade, (I think that it was in Visby), on you tube. Neither of us were paying much attention to the faces as we were sure that we didn’t know anyone there. But we were totally into all the beautiful outfits! When all of a sudden I said, hay I know that hat! My friend said, hay I know that dress! At the same time we both shouted, hay I know that woman! It turned out to be you. You looked great, marching along with the group!!! What a surprise for us, that we did know someone in the crowd! We see you all of the time on Pintress too, you appear in a lot of peoples sites. We just love your blogs! Please keep up the great work that you are doing there,Katafalk! And yes in fact you like a painting. i dont even know how i ended up here, but omg how incredibly gorgeous this dress and you in it! I love the color ,I colored yarn that way too. I was wondering if you had considered using a sachet of cheesecloth or something similar to contain the leaves for easier removal? It might wick some of the color, but would probably be easier to work with, and you could wring it out for a smaller loss of coloring water? As always absolutely beautiful workmanship. The dress and the model compliment each other in the best possible way! Beautiful and inspiring. I like your underdress and that it has no boning. Also that you show that the neckline of the underdress is lower than that of the outer dress. Thank you. It’s stunningly beautiful, and you’re so intrepid to make your own dyes! I wish we could be friends and I could learn from you! I LOVE your blog! I just found it and have spent the last hour scrolling and scrolling! Just wanted to tell you this.